R.F. - Is It Dangerous? The ubiquitous presence and usage since the 1970s of microwave ovens has made most people aware of the ability of radio frequency (RF) energy to heat substances containing water. Both animate and inanimate objects are included. 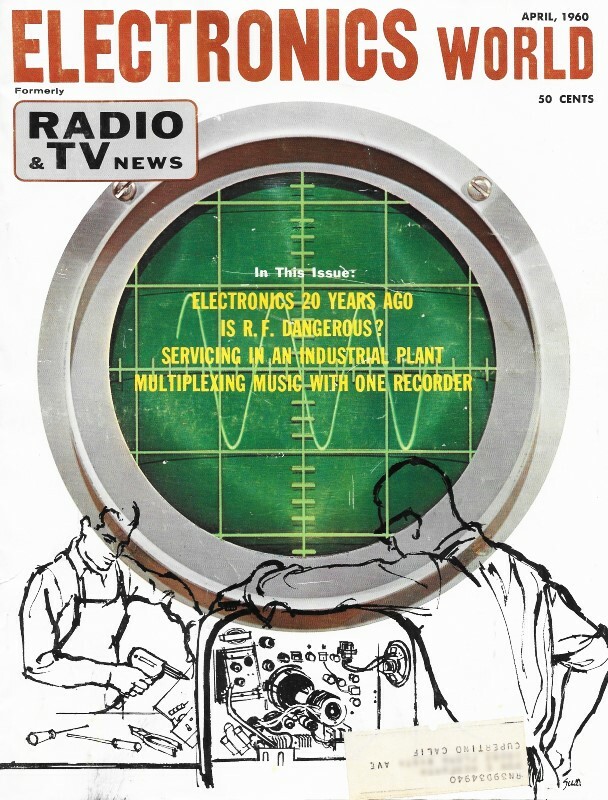 In 1960, when this article was written, the effort had really just begun to inform the general public about the potential hazards of RF energy depending on its combination of wavelength (frequency) and power. The good news about RF radiation versus beta radiation due to radioactive decay is that the former is not potentially cancer-causing. The latter is termed "ionizing radiation" because it has the ability to knock electrons off their attending atoms, and can cause cancer. Extremely short electromagnetic (EM) wavelengths above the ultraviolet can also ionize atoms, but that is well above the EM spectrum region considered to be RF. Microwave ovens are considered now to be safe when in good condition. The jury is still out (literally and figuratively) on whether mobile device (cellphones, laptop computers) radiation is damaging to the reproductive organs and brain, respectively. At certain frequencies. radiation levels and operating distances, harmful effects can occur. Editor's Note: Whenever man manipulates his environment, he runs the risk of producing harmful effects, however unwittingly, while achieving desired objectives. In the case of x-rays and atomic fall-out, there is a just concern over hazards. However, we have been handling other forms of radiant energy for communications purposes for so long that we take their safety for granted. Are we being too smug? Close range exposure of the brain of a monkey to r.f. radiation can cause death. Recent experiments by the National Institute of Neurological Diseases show that, using a u.h.f. transmitter operating in the range between 225 and 400 megacycles with a peak output of about 200 watts, monkeys can be killed in about five minutes. All deaths of such test animals have resulted from hyperthermia - excessive internal temperature. Experiments such as these raise disturbing questions. 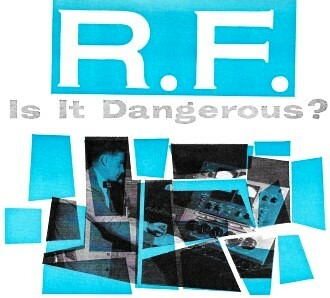 What is there about r.f. radiation that can cause death? How dangerous is it to man? Radiant energy, like other types, is produced by the conversion of matter from one form to another. Radiation is the transfer of this energy through space in the form of impulses or waves. The length of each cycle is the wavelength of the energy. The number of cycles that occur in one second is the frequency. Radiation also has the property of intensity. This is generally stated in the form of power output in watts for peak power and/or average power. This r.f. energy is a form of thermal, non-cumulative energy that produces localized heating when it is absorbed by matter, It is in this heating effect that the hazard lies. Studies have attributed the harmful effects of r.f. radiation, such as that in the microwave range, to a general rise in the total body temperature or to a selective rise in certain sensitive portions of the body. It is known that certain areas and organs are less capable of dissipating heat promptly than others. Those portions that tend to retain heat include the lungs, the eyes, the testes, the gall bladder, and the lumen of the intestinal tract. These structures are the ones most apt to be damaged by exposure. In general, deep tissues may absorb enough energy to cause a serious rise in over-all body temperature which, if permitted to go too far, produces permanent damage. In observing experimental results, it is comforting to note that rather unusual test conditions were maintained and the subjects were small, fur-bearing animals. Fortunately, actual operating conditions vary considerably from those simulated. Human beings are generally exposed in free air and seldom to a stationary, energized beam. Also, small fur-bearing animals tend to have high coefficients of heat absorption, small body areas, and relatively poor heat-regulating systems. By comparison, the human body has a superior regulating system that can adjust readily and maintain thermal stability under severe stress conditions. Tests on men show that adequate physiological function can be maintained in environments of 240 degrees F for 23 minutes, if the humidity is low. The extent to which r.f. radiation may penetrate the body can vary. It depends largely on the wavelength or frequency of the energy and the absorptive properties of the body itself. As for the amount of temperature rise in the body, this is determined by the effective radiated power output of the transmitting device, distance from it, frequency, absorptive nature of body tissue, and the length of exposure. According to Dr. Frank W. Hartman, Office of the Surgeon General, "If an individual in the performance of his duty should near the limit of his heat tolerance, and then have exposure to microwave heat, the body tolerance to temperature increase would be rapidly destroyed. A longer exposure to microwave heat alone could produce an irreversible hyperpyrexia (high fever), either local or general." Earlier references to microwave energy would indicate that the frequency of radiation is a factor in determining the hazard. This is true. Frequencies below 1000 mc. down to about 200 mc. are considered the true, deep-heating ones. What makes them especially hazardous is the fact that a dangerous rise in temperature can occur before an adequate warning is sent to the brain. Radiation in this range penetrates the outer layers of the skin and sublayers of fat, raising the temperature of deep muscle tissue. Continued exposure to the eye can cause cataracts. By the time a sense of warmth is felt, it is usually too late to avoid some ill effects. Frequencies above 1000 mc. up to 3000 mc. may be absorbed completely by the skin fat and muscle, with the degree of absorption depending on the thickness of these layers. Individuals exposed to these frequencies feel the warming effects on the skin. Immediate removal from the radiation area will probably avoid any problems. Frequencies above 3000 mc. are absorbed on the surface of the body. Since heat dissipation to the outside is excellent, a good percentage of this radiation is reflected, presenting no problem. Also, since the skin layers are very responsive to temperature change, an overheat warning is sent to the brain promptly. Measurement units that would relate a specific quantity of r.f. energy to specific biological effects have not been developed. However, threshold exposure levels have been established in terms of watts per square centimeter. This refers to the power per unit of cross-sectional area of the transmitted beam. Research shows that an exposure of 4 to 5 minutes to an intensity of 0.6 watt/cm.2 of microwave energy can cause damage to human tissues, particularly those in the eye. As a result, the Armed Forces have established a maximum safe exposure level of 0.01 watt/cm.2 What does this mean to personnel whose work involves equipment that radiates energy at the critical frequencies? In the words of Col. George M. Knauf, USAF (MC), Chairman of the Tri-Service Conference on Biological Effects of Microwave Energy, "The most powerful radar set in operation today cannot produce this 0.01 watt/cm.2 of power at 500 feet even in the axis of the main beam." Nevertheless, the level can indeed exist in the immediate area of the transmitting device. In addition to the factors already noted that determine the extent of the hazard, the clothing worn by the individual also has some effect. Recognizing that new communications and radar equipment will utilize still higher powers, the Air Force is developing special clothing to absorb or reflect r.f. radiation. While the exact nature of this "microwave radiation suit" is still classified, it will permit personnel to work safely in areas where ambient power levels are considerably in excess of the recommended threshold. While the direct effects of r.f. energy have been the main concern here, it should not be forgotten that high-power r.f. equipment may also produce ionizing radiation, which is a hazard in itself. Increasing r.f. power, particularly as generated by special tubes, may be accompanied by serious amounts of such ionizing radiation as x-rays. Harmful effects from this cause may be produced by a single, intense exposure or by chronic, less intense exposure (see "X-Rays from TV Sets: Are They Harmful?" Radio & TV News, Nov. 1958). Possible effects include eye cataracts, various types of cancer, sterility, and shortened life. In electronic equipment, x-rays are produced by such high-power tubes as the amplitron, magnetron, klystron, and thyratron. With magnetrons and klystrons, there seems to be an almost linear relationship between applied plate voltage and the production of x-rays. There is also a relationship between the physical characteristics of the power tube and its ability to produce ionizing rays. From the standpoint of x-radiation, tubes producing longer wavelengths (operating at lower frequencies) are potentially more hazardous than those producing shorter wavelengths. Appreciable radiation may also develop from cathode-ray tubes, high-voltage rectifiers, and r.f. power amplifiers using operating potentials in the vicinity of 20,000 volts and higher. With these tubes, the danger is chiefly in cumulative dosage rather than one-time exposure. As to the television set, the danger to the viewer is negligible. Protection against x-radiation is chiefly a matter of preventing exposure. Such measures as doubling one's distance from the source, for example, decreases the radiation dose to one quarter of its value. Minimum safety standards have been established that recommend keeping at least one foot from shielded sources of radiation. Dangers from r.f, radiation, either directly or through the secondary development of x-radiation, are not so great as to create a serious problem, but they do exist and cannot be ignored. The first type is a problem with microwave frequencies only. In either case, hazards exist for personnel who must work in the immediate vicinity of operating equipment. Knowledge of how and where the peril may occur is the first step in taking preventive countermeasures. 1. "Health Hazards Information on Microwave Radiation," Air Force Pamphlet #160-6-13. 2. "Radio Frequency Radiation Hazards," Air Force T.O. #31-1-80. 3. "Electromagnetic Radiation," Boeing Field service News, January 1958. 4. "Proceedings of the Second Tri-Service Conference on Biological Effects of Microwave Energy," Armed Services Technical Information Agency Document No. AD 131-447. 5. Schwan, H. P. & Li, K.: "Hazards Due to Total Body Irradiation: by Radar," Pr­ceedings of the IRE, November 1956.